In addition to counter service, Galuppi’s 620 Subs n’ Salads offers a complete array of catering services in Boca Raton with an assortment of custom made sub and wrap platters, party-size salads, boxed lunches, and catering for private parties, office lunches and school functions. Galuppi’s 620 Subs n’ Salads catering department ensures that everything is ready just-in-time for pickup or delivery and packaged so that it arrives in the same condition as when it was made. 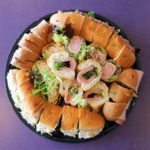 Choose any variation, combination or mixture of 12” subs or, handcrafted wraps displayed on our ready to wow any crowd platter. Designed to feed 12 people per platter (4” sub or wrap per). All subs are served with lettuce, tomato, provolone cheese, salt, pepper, oregano. Mayo, mustard, oil and vinegar on the side. Additional toppings upon request. All wraps are served with lettuce, tomato, provolone cheese, salt, pepper, oregano. Mayo, mustard, oil and vinegar on the side. Additional toppings upon request. Ready for all taste buds, our crafted salads are delivered in ready-to-serve black bowls with homemade dressings on the side. Cobb – Romaine, mixed greens, blue cheese, eggs, tomatoes, avocados, apple wood smoked bacon, served with ranch dressing. We have our run of the mill mixed platters of cookies. Or you can jump off the deep end into the chocolaty goodness of our gourmet cookies, that are Hersey’s kisses red velvet cookies, to big for their own good. Meat lovers – an artfully arranged platter of meats, thinly sliced roast beef, turkey, salami, ham and capicola. Sliced Cheese Platter – Provolone, American or Swiss cheese freshly sliced and displayed. Gourmet cheese platters – Creamy brie, fruit or nut encrusted goat cheese, bleu cheese or fresh mozzarella and assorted crackers. Cheese Nibbles – Cubed cheddar, Monterey jack, Swiss and provolone cheeses cubed and ready for picking. Meat and Cheese Nibbles – Bite sized cubes of assorted cheeses, turkey, ham and salami. Fruit Platter – Fresh seasonal fruit artfully cut and displayed with seasonal berries and grapes. Caprese Salad Platter – Thick cut tomatoes, fresh basil leaves, and whole milk mozzarella cheese drizzled with balsamic reduction and olive oil. Awesome Foursome – Roast beef, roasted turkey, and ham with imported Swiss and white American cheese. Antipasti platters – sliced salami, ham and capicola platters served with balsamic glazed tomatoes, fresh mozzarella and provolone cheese. We have all shapes and sizes. Serving coke products, from canned, to 20oz bottles, 2 Liters, and even bottled water.